Can I tell you about my BFF? Last week, I wrote to you about the unmistakeable sign God sent me at a writers’ conference I attended the weekend before. He was telling me to “Forgive,” by placing that word in hard, cold metal form on a table with my name pointing to it. If you haven’t had a chance to read the post, you may want to check it out before reading on. This was a softer, gentler message from God to me. It didn’t knock me upside my head the way the word “Forgive” did, but it was a comforting reminder to me that God is with me. Always. Because of Him, I am never alone. As a writer – and a shy, introverted one at that – I feel isolated some days. On rough days, my home office feels like a cage, and I flap my wings to break free. Other days, the office is a sanctuary of quiet and serene calm where I can sit in God’s presence and drink in His words while I pour out my own. So what makes one sort of day different from the other? 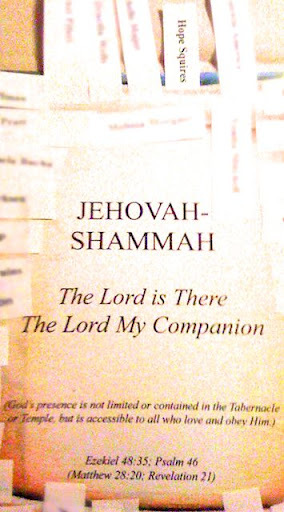 God is Jehovah-Shammah, always there. But I’m not always in the right frame of mind to sense His presence or His companionship. This reminder in the prayer room was perfect for me, a gentle breath sighed out over me. He was my ever-present companion during the conference weekend (though He also surrounded me with several wonderful, new friends). And because He was with me, I felt a confidence and a comfort that doesn’t always come naturally to me. This second sign of the weekend was a reminder for me to rely more on God. I haven’t “friended” Him on Facebook. He hasn’t joined any of my circles on Google +, which is probably just as well, as I haven’t even remotely figured out what to do with that whole new social media avenue yet. We don’t exchange emails back and forth. He hasn’t commented on one of my blog posts. And yet, there are days that I find myself obsessively checking these online channels to see if someone, anyone, has connected with me. To feel that there’s someone who is “there,” who is my companion. Have you ever found yourself logging in to Facebook right after you had logged off, just in case …? I’ve learned to use those moments as time to turn to God, to lift up prayers to Him, to ask Him to sit with me in my office – or wherever I am – and to hear from Him if there’s someone I need to reach out to. Don’t get me wrong. I’m blessed with truly wonderful friends here on Earth, but I know that there’s always One I can call on who won’t be too busy to talk. He’s my BFF, my best friend forever. Do you know Him? Is He your BFF, too? This entry was posted in flourishing tree and tagged Jehovah-Shammah, She Speaks, social media by hopesquires. Bookmark the permalink.